Sterling Capital’s Advisory Solutions Team provides an array of multi-asset class investment models for wealth and institutional clients. Our customized client solutions utilize a fundamentally-driven and quality-focused investment process with a goal of delivering outstanding long-term risk-adjusted performance. 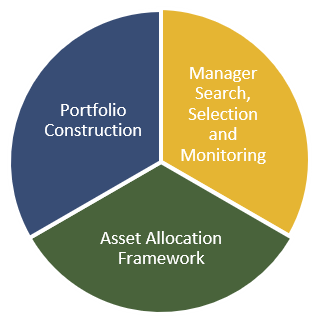 Comprised of seven seasoned investment professionals and led by James C. Willis, CFA®, the team’s process includes comprehensive asset allocation, manager search and selection, and portfolio construction. We employ a comprehensive and rigorous manager search and selection methodology that is rational, well-defined, disciplined, and consistently applied to identify investment strategies that we believe are positioned to consistently generate risk-adjusted outperformance for our clients throughout multiple market cycles. Our asset allocation process applies deep historical analysis and rigorous testing to identify market information that is systematically mispriced. Asset class return forecasts are considered within a detailed risk framework to determine asset class weights. Portfolio risk is tactically managed based on the attractiveness of investment opportunities while adhering to a set risk budget. Complementary investment strategies are combined with the asset allocation framework to produce a favorable risk and return profile. With a clearly defined and unwavering dedication to client service, our process allows you to focus on managing your practice/business.